These four newly released Scholastic Books are perfect for sharing with your grand on a lovely spring day. Here are the first two books in this exciting new series. As Nixie nears graduation from the Royal Mermaid Rescue Crew School, it is time to pick a magical seapony partner. Nixie ends up with Rip. Rip is first in his class and a very strict rule follower. He is quite the opposite of Nixie. Will Nixie and Rip be able to overcome their differences to keep the seas safe? Follow them through the kelp and along the reef as they struggle to find a way to work together. Princess Lana is featured in this second book in the series. 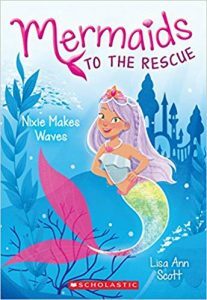 Princess Lana is still a student at the Royal Mermaid Rescue Crew School. As she sits in class, she often knows the answer but never speaks up. This leads the principal to have doubts about Lana’s ability to be a Rescue Mermaid. 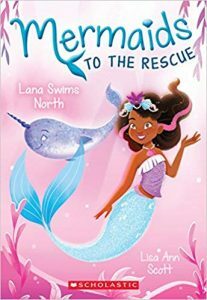 One day Lana meets Spike, a narwhal who has been living with a pod of dolphins. Spike wants to swim to the Arctic to find others like him. Lana decides to tag along. The Northern Seas open up a new world of friends and activities. But when a crisis arises will Lana stay silent like in class or take the lead and avert disaster? You’ll have to read the book to find out. Lisa Ann Scott is the author of the Enchanted Pony Academy series, the Wish Fairy series and the School of Charm. She has been a TV news producer, reporter, and anchor, and she currently works as a voice-over artist. She lives in upstate New York with her husband and two kids. 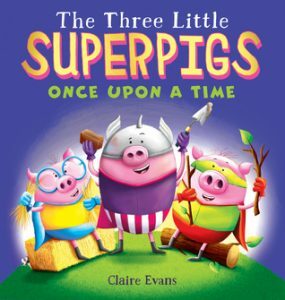 This is a modern superhero twist on The Three Little Pigs. They grow up dreaming of becoming superheroes. When their mother tells them it is time to strike out on their own, they each build a house – one straw, one sticks and one brick – sound familiar? The big bad wolf makes his appearance at the first two houses and we all know how that goes. But when he tries to blow down the brick house, the story takes a new turn. Read this fun and colorfully illustrated book to find out what happens to the wolf and the three little pigs. 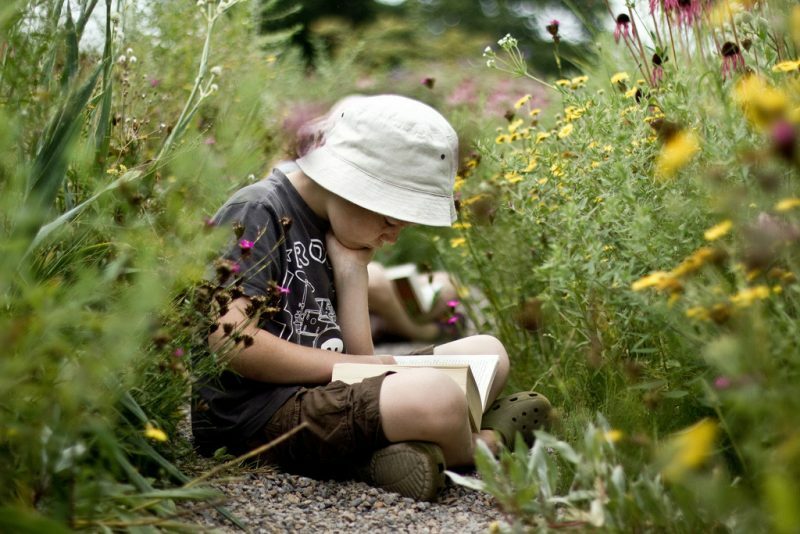 Claire Evans is an author and illustrator from Liverpool, England. Her other books include The Chicken That Hatched the Cow, Robot Stop, and The Bear and the Hair. Mrs. Barrett runs an adoption shelter and opens it for adoptions when there enough dogs and cats. Everyone tries to look their best. 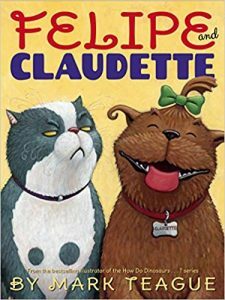 Every time, all of the animals are adopted Felipe and Claudette. Felipe is a grumpy cat who Claudette is a playful dog who is always ready to play. Felipe is convinced that the two are not being adopted because of Claudette’s wild behavior. Claudette makes a lot of loud noises, digs holes and gets all kinds of stuff stuck in her fur. One day, Claudette is adopted by a man who is not bothered by all of her bad habits. But something strange happens. Felipe is very quiet and doesn’t complain about anything and Claudette stops barking and running wild. What is going on with this unusual behavior from Felipe and Claudette? You will have to read the book to find out what happens to these unlikely pals. 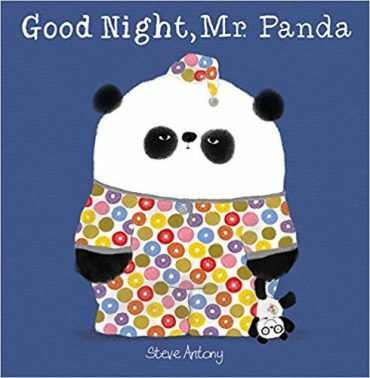 The illustrations are fun and match the narrative well. Mark Teague is the award winning children’s book author and illustrator of his own bestselling Dear Mrs. LaRue series, as well as The Sky is Falling, The Three Little Pigs and the Somewhat Bad Wolf, The Tree House That Jack Built by Bonnie Verburg and many other humorous picture books. His illustrated novel, The Doom Machine, received excellent reviews. Mark lives in the Hudson River Valley with his wife and their two daughters. Jeanette Perkins is the grandmother of two adorable grandsons. She lives in beautiful St Pete Beach, FL. Jeanette is a product reviewer for GRAND and is looking forward to reviewing lots of new and useful products for all us grandparents. 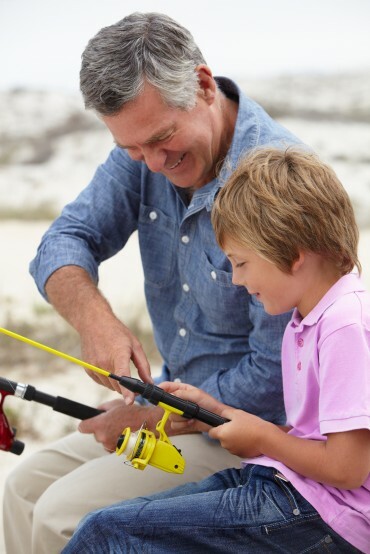 If you have a product for boomer grandparents and or their grandkids, tell us all about it in an email to editor@grandmagazine.com.